Norw.Swed.Finn.Ch. 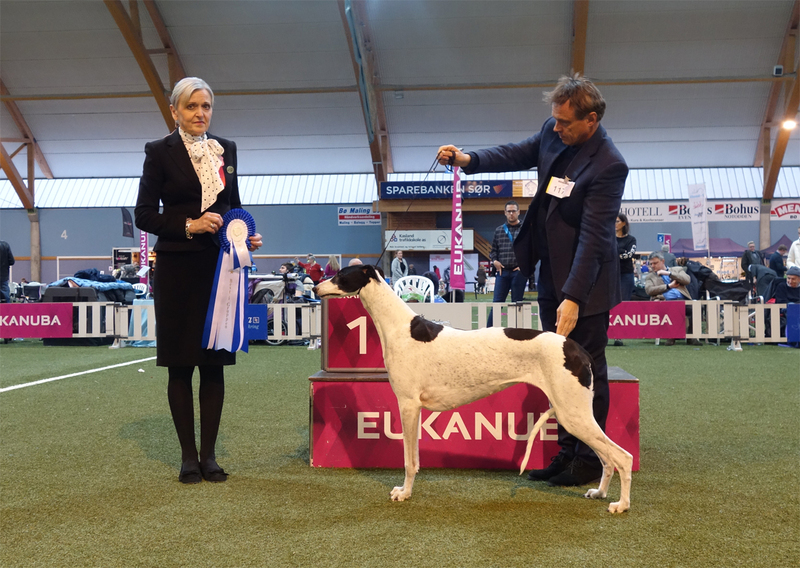 Jet’s Just The Way U Are, Hannah, is pictured winning BOB under breed specialist Katrin Raia from Estonia in an entry of 20 greyhounds on the way to BIS at Gran 2018. Hannah is owned by Åge Gjetnes and Espen Engh. 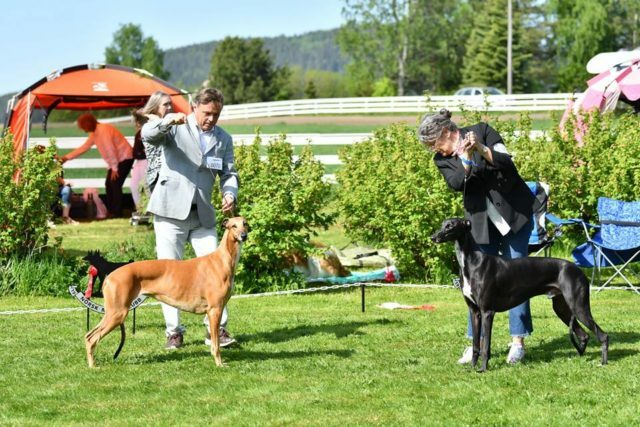 Jet’s Just What You Want, owned by Aslaug Skårnes Ness, won her Norwegian Championship at the Norwegian Sighthound Club main specialty at Gran on May 19th. Wilma thus became our 210th homebred greyhound champion. Jet’s I Just Can’t Wait No More, Madison, won her champion title and her first CACIB today at the international show in Kristiansand. Many congratulations to owner Mari Alver. Grandmother Prudence (J. Moonlight Serenade) won another Best Veteran in Show award and BOB. Int.Ch. Jet’s Moonlight Serenade, Prudence, made her debut in the veterans class by not only winning Best Veteran in Show, but also BOB, the group and then Best in Show at Bø International in an entry of some 2500 dogs. Prudence is owned by Espen Engh, Åge Gjetnes and Pauline Oliver. Ch. 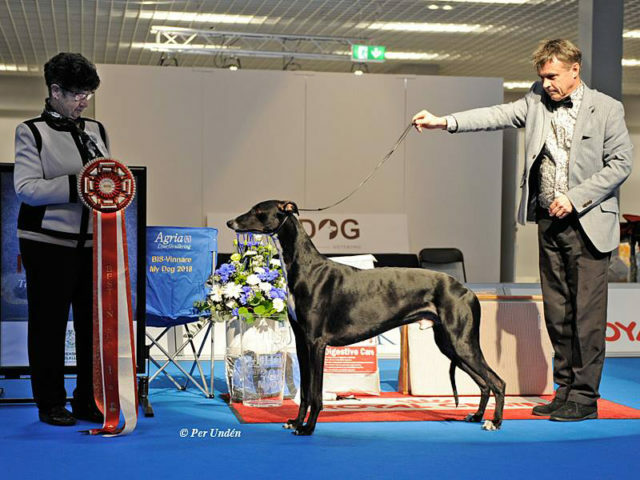 Jet’s Just Leave Me Hanging On, not content with finishing his international championship title on the day went all the way to Best in Show at Gothenburg International in competition with more than 4200 dogs! Huge congratulations to owners Tore and Morten! Congratulations to the owners of the two new international champions made up this week-end in Gothenburg, Sweden: Norw.Swed.Dan.Finn.Nord.Ch. Jet’s Just Leave Me Hanging On (Rio), owners Tore and Morten Berg-Vingen was BOB with Norw.Swed.Dan.Nord.Ch. Jet’s Something in the Moonlight (Frida), owner Brit Schöne Brodwall and Jon Brodwall was BOS with their new international titles. Congratulations! We celebrate being #1 Griffon Bruxellois breeder in the UK for 2017. Many thanks to mentor and breeding partner David Guy for making this possible. Int.Ch. Jet’s Ivy Leaf, always owner-handled by Anita Weirud, was Norway’s Top Griffon for the third year running, ending the year with BOB at the Norwegian Winner Show 2017. Many congratulations! Int.Ch. Jet’s Just Be A Man About It is Norway’s #1 Greyhound 2017. Always owner-handled by first time greyhound owner Charlotte Johansen, what a fantastic result!!! 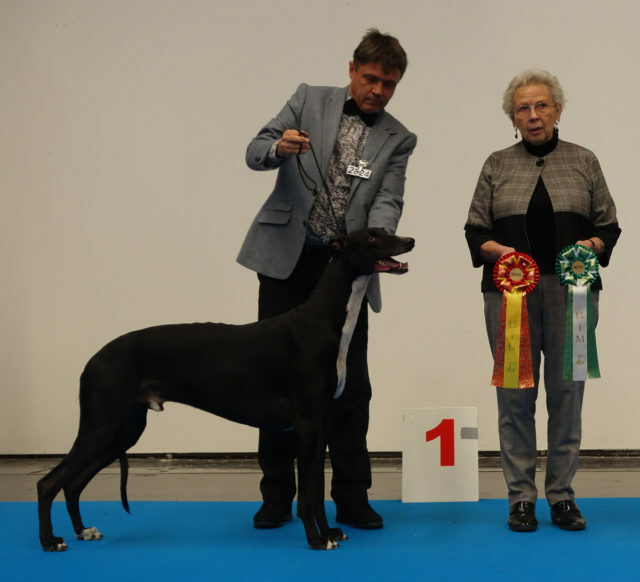 Loke ended the year as BOB at the Norwegian Winner Show. Many congratulations! Int.Ch. Jet’s Ivy Leaf, Tommy, has recently won his 50th championship show BOB to become Norway’s top winning Griffon Bruxellois for the third year running. 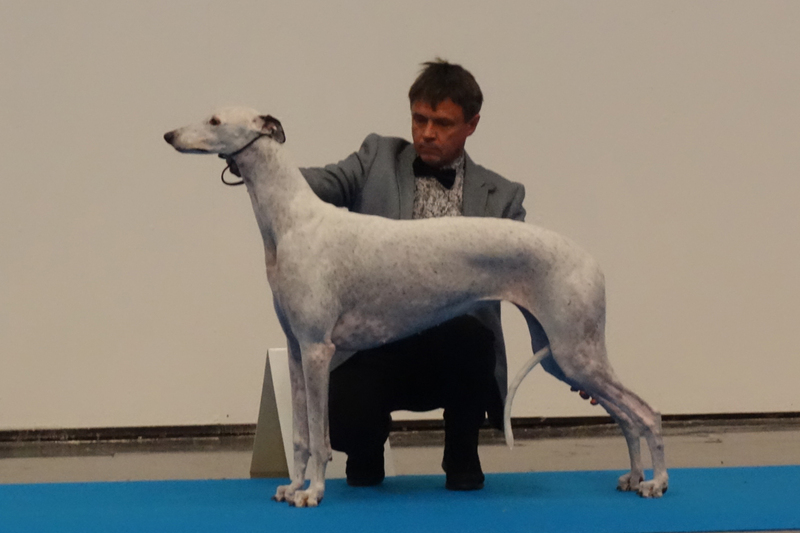 Tommy is always owner-handled by Anita Weirud and may now claim to be the top winning Griffon ever in Norway.